True confession: I like opera. I’ve been attending performances and listening to recordings since I was a boy. For a few seasons, I was even a subscribing member of the Pittsburgh Opera. So when a friend scored free tickets to a recent performance of La Bohème at the Hanoi Opera House (Nhà hát lớn Hà Nội) , I was happy to go and see how the locals put on a show. Although opera is commonly considered high-brow, upper-class entertainment, it should be remembered that, for centuries, opera was Europe’s street theater. 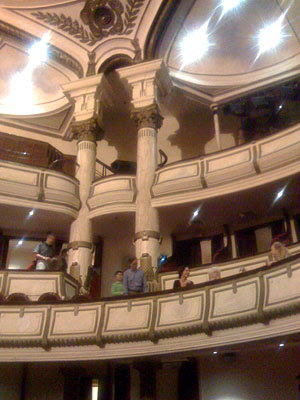 It’s always had its high-brow side – a number of operas were commissioned by royalty and played to exclusive audiences. But there is a second strain to opera’s history, a tradition of musical theater performed by local singers and musicians, that was as popular in its day as American Idol is today. 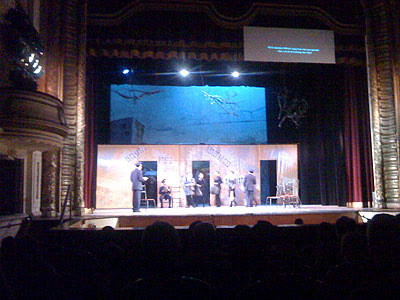 Hanoi’s performance of La Bohème, although performed in a high-brow venue, seemed more in line with opera’s populist tradition. Performed by Vietnamese singers with a mostly-Vietnamese orchestra, it was a not-entirely professional but fully energetic performance of Puccini’s famous work. That Hanoi even has a local opera company highlights a side of Vietnam I have grown to admire: its ability to weave elements of foreign cultures – even the cultures of former colonizers – into its own cultural narrative. France’s continuing cultural legacy in Vietnam underscores this point. As much as any European power, the French extended their culture into their colonial territories. Even while exploiting the colony’s resources and manpower, there was a strain of thought which saw French colonialism as an opportunity to bring the “benefits of civilization” to the people they colonized. Though French colonialism proved intolerable as an institution, during the colonial era in Vietnam the arts fluorished. Vietnamese writers, schooled in the French lycées, were prolific; the École des Beaux-Artstrained a generation of Vietnamese painters; and traditional Vietnamese theater was supported and influenced by ther French stage. Hanoi’s Opera House – a replica of the Palais Garnier in Paris – was completed in 1911. It ran regular performances by mostly-French troupes until the 1950s, whereupon war and overall deterioration forced it to shut its doors. This architectural gem remained closed for 40 years, until the government of an independent Vietnam commenced to restore it in the 1990s. Since its reopening in 1997, it has once again become a center of Hanoi’s cultural life, serving regular offerings of European and Vietnamese arts. Traditionally, the Vietnamese reaction to France’s cultural expansion was to absorb French influences into its own local traditions. Thus, the 1920s saw lacquer painting marry traditional Vietnamese techniques to modern European aesthetics, the New Poetry Movement of the 1930s and 40s expressed the clash between Confucian ethics and western-style individualism, and the áo dài, Vietnam’s national dress, was born from the marriage between 19th century traditional Vietnamese woman’s garb and 1920s Parisian haute couture. Indeed, Vietnam’s east-west blend is visible on every street sign, as Vietnam was the only Southeast Asian country to adopt the Latin alphabet as its national script (quốc ngữ). But for all this culture-blending, there were areas where imported Western culture was accepted with few changes. Breadmaking, for example, was one of them. In today’s Vietnam one can find a decent baguette in nearly every corner of the country, along with a cup of coffee (to see how coffee has been transformed into a Vietnamese culinary offering, read A Vietnamese Coffee Primer). French pâté, croissants, and pastries are all part of my regular fare living in Hanoi, all part of France’s legacy in Vietnam. Professor Hữu Ngọc writes, “There is no pure culture. Everything is a mixture.” Though it may not be immediately apparent, the European culture France brought to Indochine continues to permeate modern Vietnam, in much the same way that Europe continues to be influenced by the cultures of classical Greece and Rome. Thus it is that, on a lovely spring Hanoi evening, I was able to hear soprano Lê Thị Vành Khuyên’s lovely rendition of Puccini’s famous aria,Quando m’ en vo’ soletta, and have it feel like a natural merger of Europe’s own popular operatic tradition, and something comfortably Vietnamese.